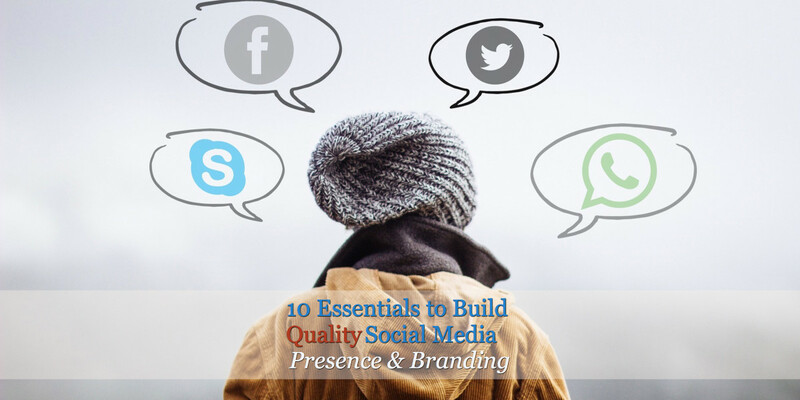 What would you recommend to #startups looking to build social media presence? Startups are highly results-driven. Well, every business is (and should be). With the so many “experts” and “gurus,” where should you begin? It’s a jungle out there, and information can be overwhelming. The startup company that asked me the question. I often come across businesses who ask which social media platforms they should use. Doesn’t that seem like putting the horse before the cart? It is a reasonable question to ask, but concern for such should not overtake concern over your goal. Be clear about your purpose for using social media marketing. Having an explicit goal to focus on is like driving. The brain, if you notice, has the tendency to cause the car to swerve toward what the driver is looking at. You observe what’s around you, including the competitor, but your eyeballs should be primarily toward your destination. You can navigate through traffic or take another route, but that does not change the destination. . Question for you to answer: What is YOUR goal for your business startup? I cannot stress enough the importance of knowing the answer to that question. A defined goal helps your team plan strategic & measurable steps; while, in the process, you also keep resources in check as you strive to reach it. Understand that each goal may have different actions or call it tactics, if you will, that your team might need to develop. That is why with the reality of having stringent resources and the desire to have to scale it, you have to be clear about what you want to achieve. One way to do this is by determining your key performance indicators. You can take a hint from Facebook to establish what may be your preferred key performance indicator or KPI to reach a marketing objective for your business success. Contact Us – This is if you would like people to contact you directly if they have any question. Get a live link to your website’s “Contact Us” page. Sign up – This is if you would like to get more subscribers and if you are building your mailing list. Did you know that 50% of site visitors NEVER return to your site? So if you are paying ad to drive traffic to your site. The best bang for your back is to marry that up with your mailing list. Play Game – This app is perfect if you have a game that you have developed. Watch a video – This is perfect if you like to increase visibility about your product and services. While everyone can be potentially your client, not everyone is a customer. You may have several segments of your audience, or just one. It can be by geographic location, age, job, title, etc. Why is identifying audience is important? One reason is that different age groups have different habits, expressions, and social media platform preference. 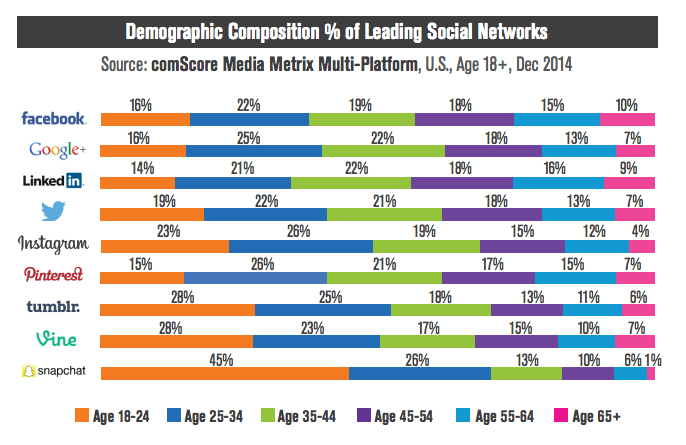 comScore released this social media networks demographic. What it is telling us is that the various groups hang out in different platforms! Age Distribution of Top Social Networks | Who’s in what? Another reason is, depending on resources and extent and depth of your approach in marketing, you may need to prioritize which social media tool you have to be on first or spend more time on. Know the language they are using, the type of social media message they like to follow and content they like to read. Some social networks give you the ability to get a glimpse of what they like, what they are reading and in some instances info can be granular. Marketing to an identified group with a targeted approach can potentially help cut costs, and yield better results because you can manage and focus your efforts more efficiently. Tip for your Success: Go and find your ideal audience and engage with them. Add value to the conversation. If you are uncertain on how to jump in on a conversation without appearing like a spammer, check these tips on how to join social media conversations from pros. There is no such thing as perfect social media monitoring tool, but there are useful tools out there. Determine what you like to monitor and see if any of the solutions out there has all, if not some, of the features you need for benchmarking. I would suggest you to try either of these Hootsuite, SproutSocial or Buffer. (I am not an affiliate of either). “Measurement provides marketers with results to iterate and evaluate business decisions. By continuing to learn from measurement results, you can more effectively inform your campaign strategies, whether those strategies are more tactically driven or strategic to the brand. It is always great to have a benchmark. It is not just about showing up every day. You’ll find that soon enough if you start benchmarking your efforts. You can argue and reason that data shouldn’t be so, but numbers don’t lie. Numbers are great indicators of what is working and what is not. Take stock of what the data is trying to say, and use that information to develop appropriate strategies or change existing ones to achieve your marketing objectives. I posted this tip on Instagram, which I later shared on Twitter. It brought up the question above from one of our Twitter followers. Be consistent with your message. Keep your posts on-topic You don’t have to be in social media from sun-up to sun-down. Mix up your posts without straying from your objectives. Aside from your message, be consistent with your relevance, make posts appealing to your audience. 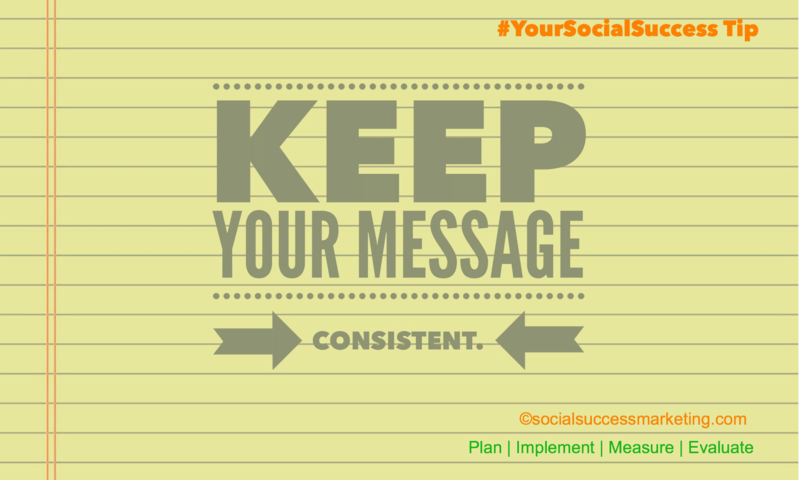 Be consistent in engaging with your audience. It is “social” media, remember? Respond to relevant conversations. Be consistent with your presence. Don’t show up one day and then gone the next. Be there regularly. Every click, every mention, every retweet, every share will add up to your reputation as a business. Everything you do is like raindrops; rain makes puddles. If the rain is non-stop, that could cause a flood. In a way, your digital activities are like that. You will reap fruits of it in due time. With the so many digital distractions surrounding target audience nowadays our efforts should be not only tactical but also strategic. For ANY tactic to be strategic, it has to meet a particular goal. Begin by understanding who you are as a company, what you want to become and how you will achieve it. Ask yourself: “Why am I doing what I am doing?” As an example, “Why am I posting this [breakfast]?” 😀 Really. If you want to go slow, do it the organic way. Expect to spend plenty of man-hours to achieve satisfactory results. If you wish to scale growth, pay for ads. I recommend that you do a combination of both. If you don’t have time to “experiment” this get a consultant who knows what he/she is doing and is not learning on your dime. Whether you choose to grow the organically or by paying ads, both aren’t free. Grow slow, organic; grow fast, pay ads.This is assuming you have a clear goal, AND objectives in place. Social media on its own can be hit or miss. Social media touches other facets of your business. Use it not just as a vertical but with a wider lens. You can use it together with your other marketing investments to attract, engage and acquire customers. 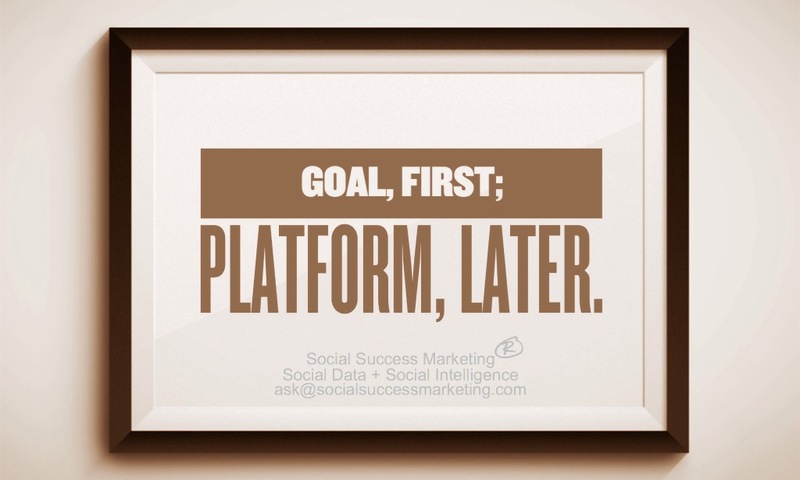 Therefore, it is necessary to map your social media objectives back to your business goals. Elizabeth Dodson, the co-founder of HomeZada, a cloud-based home improvement, and organizational software startup company, is sharing the following sage advice to startups like HomeZada. HomeZada stumbled when it first launched its social media presence due to a lack of knowledge about the platforms and lack of understanding of what mattered to their audience. After carefully reevaluating and educating ourselves on social media, we understood what needed to happen in order to embrace and support our followers. For any startup looking to build a social media presence, I would recommend that they first do their research about the platforms and what will interest their audience. Second, I would suggest understanding the time allocation needed to commit to social media and determining what time is available to manage this initiative. Moreover, finally, I would look at the social media platform or platforms that most resonate with your business. If you are a B2B organization, then LinkedIn might be your best forum. If you are a B2C, then maybe Facebook or another platform. Once you secure your platforms, understand what information is valuable to the audience on each platform. Republishing the same pieces to all the platforms may not resonate with your audience of one platform, but may resonate with your audience of another. Each social media platform is different. As such it has different audience and nuances. There is a learning curve involved in the process. That includes trying to catch up with the constant changes that go on with each platform. If you want to manage it, get an experienced social media coach, *cough* we do that, whom you can check in regularly about what you are doing if you’re on track – or not. If you don’t have time to run social media yourself, hire a social media consultant who is not learning it in your dime. Stay clear from anyone who’d promise a quick result. Social media does NOT work that way! What would be your tip to build a killer social media presence? Leave it below.